To the regular readers of my blog an apology for not updating this blog since early January. I have spent three and half weeks in return Brazil and since my return a week ago I have been busy with shopping, decorating and other onerous tasks. This post covers the first few days of January and a couple of trips to west Dorset over the last couple of days. I have yet to edit the many photos taken in Brazil, let alone update them to the blog, but they will follow eventually. We had a couple of birding trips before I left for Brazil, to Blashford Lakes and to Wyke Down but the best by far was the intensive birding on our annual bird race on 4th January. Postponed from the day before due to bad weather, we had an excellent day, travelling from the Poole area to Weymouth and back again starting at 0500 and ending at 1730. Three teams took part and we won with a score of 126 species seen/heard during the day, three ahead of our nearest rivals and only 3 short of the all time winter record. Our first destination was Shore Road, Poole Harbour in hope for Bar-tailed Godwit. 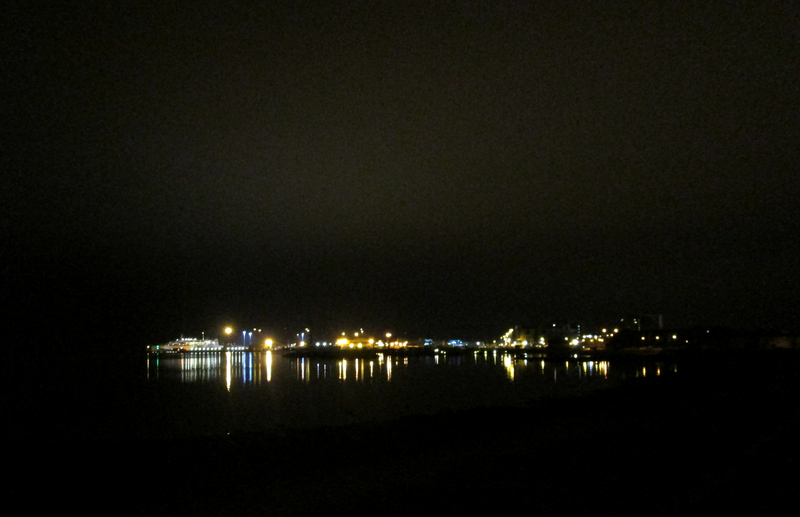 Why visit the foreshore of Poole Harbour in the dark, when the birds could be so much more easily later in day? Simple, if we could see Barwits before dawn we could later avoid the northern shore of of the harbour and all the potential delays that traffic and the Studland car ferry could produce. I’m glad to say we were successful, seeing the birds by the light of street lamps. On 7th February Margaret and I had a day out in west Dorset. Our first destination was Tincleton near Dorchester where we located the single Bewick’s Swan in a flock of Mute’s. Bewick’s Swan was once a regular visitor to Dorset and adjacent areas with counts of up to 120 at Tinkleton and similar numbers at Ibsley in Hampshire. Milder winters have allowed more Bewick’s to winter on the continent and feeding at the WWT reserve at Welney has induced most of the birds that reach the UK to stay in East Anglia. The bird we saw at Tinkleton was hidden by trees so I have added a photo of a Bewick’s Swan I took at Ibsley in the Avon valley last year. 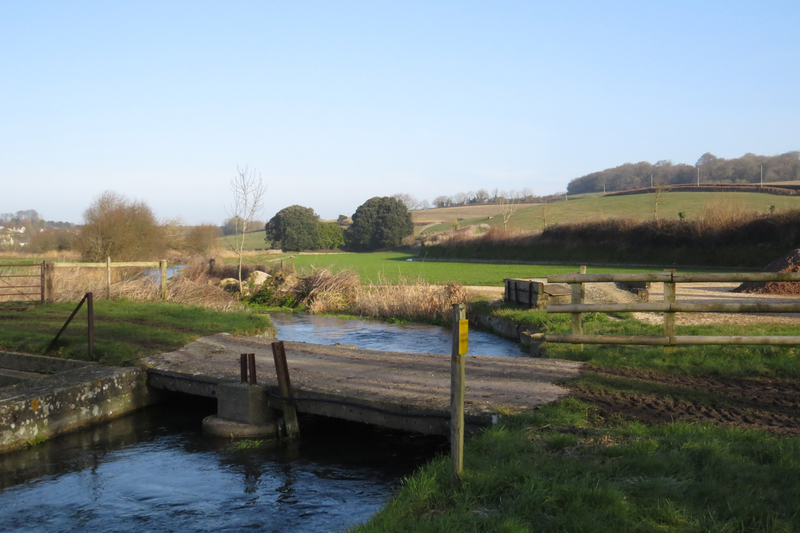 Earlier we called in at the cress beds at Bere Regis, a good spot for Green Sandpipers, Grey Wagtails and if you are lucky Kingfishers and Water Pipits, although we had no luck with the latter two. 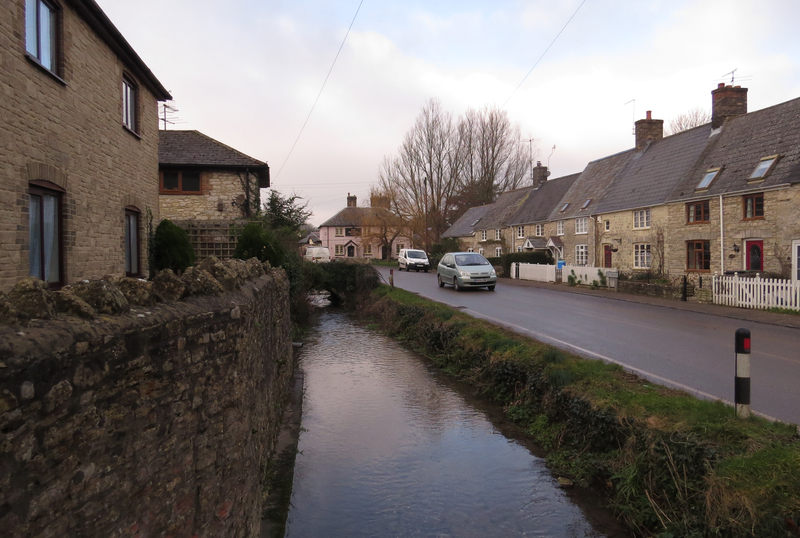 We then travelled westwards to Abbotsbury, on the way we passed through the picturesque village of Martinstown …. 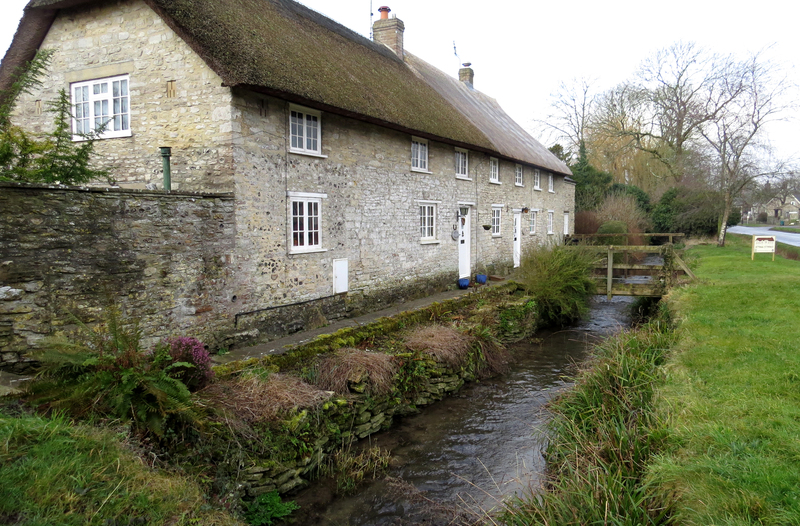 … which comprises a series of charming cottages with a stream for a front garden. From here the road climbs up to Hardy’s Monument with panoramic views in all directions. 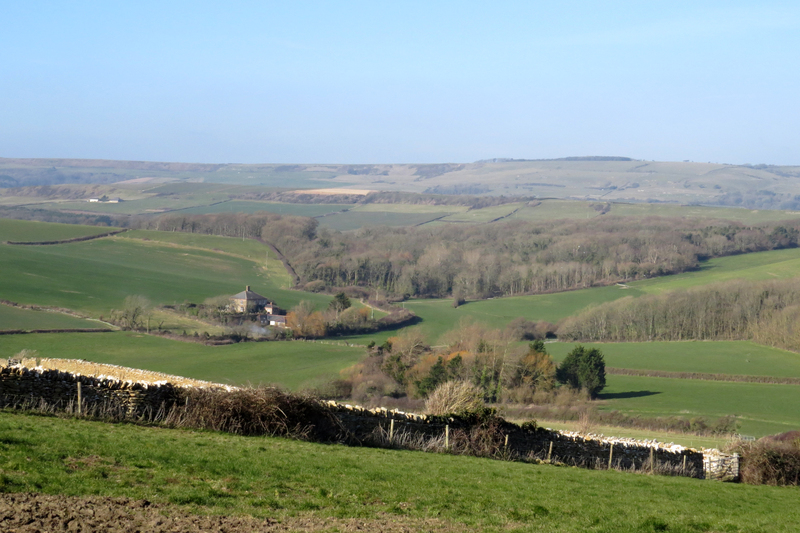 The road that leads from Hardy’s Monument to Abbotsbury is narrow and progress is slow, however the view more than compensates. This is perhaps my favourite drive in all of Dorset, but in the morning the view to the south is always into the sun. The Fleet and Portland can just be seen in the distance. Someday I’ll drive this way on a clear summer’s evening and take some better shots. 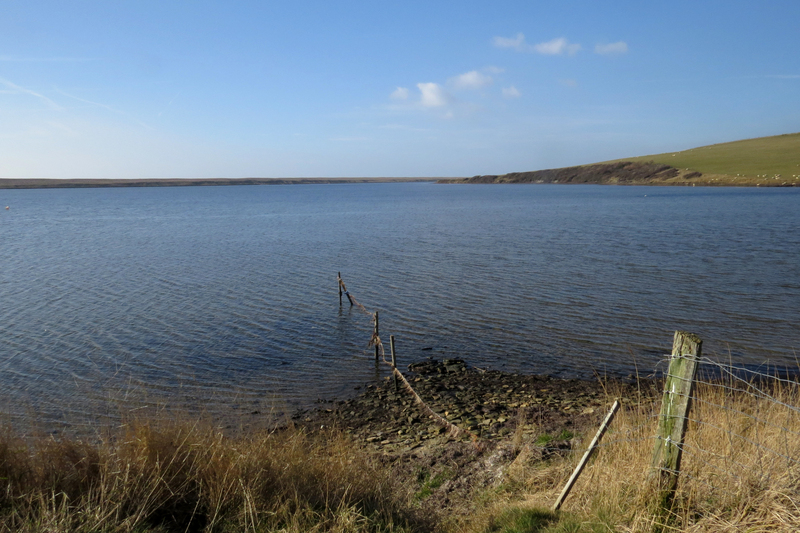 Abbotsbury Swannery is closed for the winter but distant views are available from the Rodden road. We saw the Greenland Whitefronted Goose briefly before it swam out of view and later we drove on to Langton Herring and walked down to the Fleet at Rodden Hive. 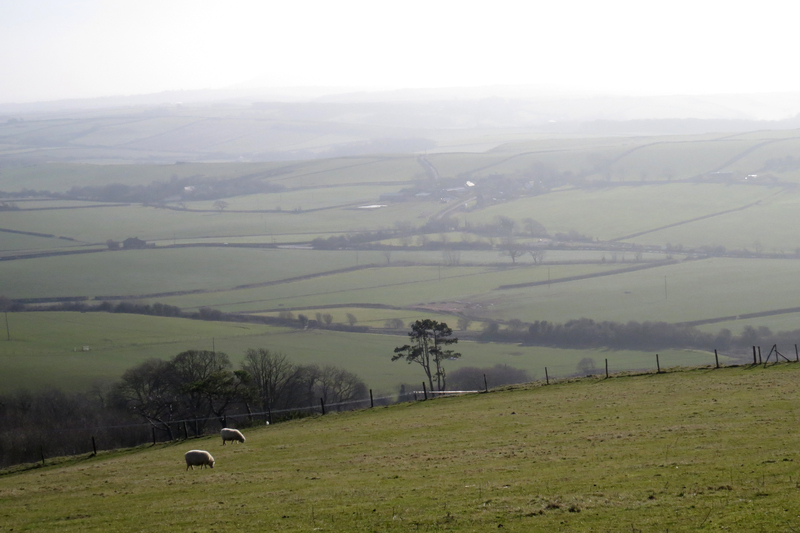 The view to the north from Langton Herring is shown above. …. 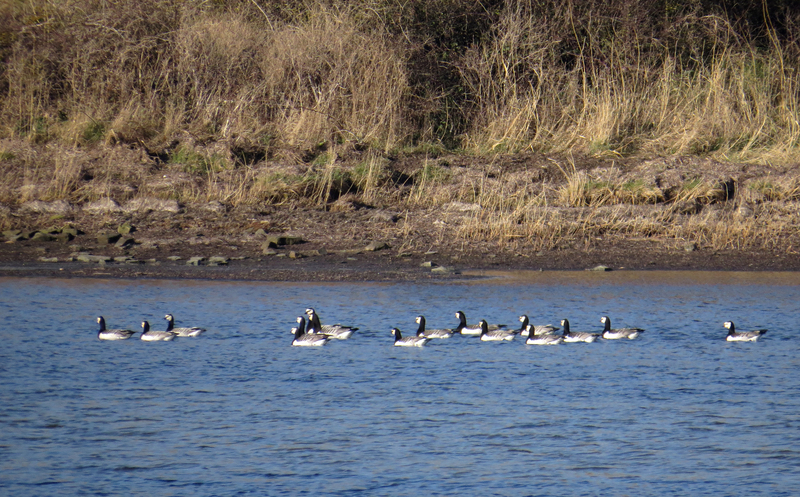 but we had come to see this flock of 16 Barnacle Geese. Barnacle Geese from Svarlbard and Greenland winter in Scotland but there is also a substantial number that winter in Holland It is debatable whether the occasional flock that turns up in Dorset in winter comes from the Dutch wintering population or from the feral population. The fact that these birds were wary and flew off soon after we arrived, were unringed and don’t associate with Canada Geese indicate to my mind that a wild origin is probable. In fact using those criteria they are more likely to be wild than the Greenland Whitefront which has been associating with Canada Geese! Rare bird news seldom breaks when it is convenient. I had just got home when I learned that three Cirl Buntings had been located a few miles from Abbotsbury. This species was once widespread in south of the UK but the range drastically contracted from the 1960’s onwards with agricultural intensification. The last breeding in Dorset was in 1971 and since I’ve been birding they have been lost from Somerset and almost lost from their stronghold in south Devon. Vigorous conservation measures, including a reintroduction program in Cornwall have turned their fortunes around and maybe, just maybe, they are beginning to recolonise west Dorset. The birds had been present for some time but local observers wished to keep this quiet until the site could be made secure from disturbance. This is the same view as above in much cloudier conditions, taken when I returned to see the Cirls on Monday morning. The three Cirl Bunting showed well, if a little briefly. Far too far away for photos, I have included a shot of a male taken in Devon in June 2011, which was I think the first bird photo that I ever uploaded to this blog.